By voltagegate on May 29, 2007. Morphologically, the red panda is a strange little furball. They are categorized with carnivores because of their powerful set of reinforced jaws, but the only meat the red panda will ever eat is the occasional bug. Like the giant panda, bamboo makes up most of its diet, one of the least nutritious foods on the planet. 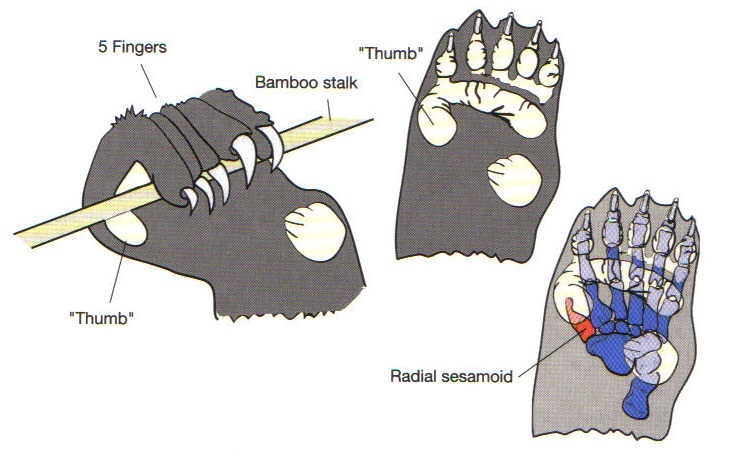 But the red panda and its ancestors have been eating bamboo (and other similar monocots) for so long, that a small wristbone called a radial sesamoid (highlighted in red below) has become modified into an extra "thumb," assisting the panda in grasping and stripping bamboo stalks. This is a quintessential example of a preadaptation in evolution. Preadaptations result from an organism's novel use of an existing structure. In other words, the red panda's wristbone was already there extant in its ancestors, and happened to become useful in grasping bamboo. After thousands of years of selection, the bone has become larger and more helpful in the population. The panda did not grow a whole new finger because the set up for a new finger was not ancetrally available for modification. Preadaptations show that evolution is not purpose-driven; there is no intelligent driving force behind the process, and therefore no end goal. Natural selection is a tinkerer, not a designer. This is also the force that has allowed the red panda and giant panda to live side-by-side in China subsisting on the same food source without competition. Next time we'll look at how this is possible, and the challenges that the red panda faces in the modern expansion of China. Friday Sprog Blogging: animals at the zoo. Thanks for this post! I knew red pandas consumed plenty of bamboo, but I was unaware that they too had their own "thumb." I guess that feature (in addition to others) further caused the confusion as to where the Giant Panda belonged when it came to taxonomy. Ian had some RL issues come up, so this months Oekologie will be a little late. Yet another great Monday morning read from Wayne (even if it was posted over the weekend): an explanation of the thigmonastic response, leaf folding in plants, and the differences between movement in animals and movement in plants. Wayne found a neat little site the other day and was kind enough to share it with us. Curiosities of Biological Nomenclature is a site of the strange and notable names given to organisms over the years. It's definitely worth a look.